Writing an online ‘walk-through’ to a computer game of Borgesian complexity can take up a lot of time. So much so, it can be difficult to see things turning sour in the real world. As our narrator grapples with his players’ guide, life starts to intrude in troublesome ways. Things aren’t going so well with the live-in girlfriend and the job preparing ‘cooked circular food’ is getting increasingly hard to stomach. To top it all, the best friend is clearly depressed and acting weirder by the day. But despite all this, his attention is focussed on The Broken World – an engrossing, possibly addictive, adventure that takes him from town to town in a struggle with zombies, agents, puzzles and mysteries. It’s not clear which of these worlds – the real or the online – is the more challenging, or where survival tips are more urgently needed. What is clear is that he must work out solutions to problems involving life and love and happiness, not just in The Broken World, but in the real one too. ...an exhilarating and poignant tale of love, loss and computer games that ought to make the leap from "cult classic" to"popular success"... The Broken World is ultimately a humane and heartfelt book, with a proper emotional core wrapped up in a giddying fantasia. It manages to be desperately sad and desperately funny at the same time. It is a book of big ideas, cunningly delivered through a slacker's shrug. The paraphernalia of the cyberworld is lavishly reconstructed. Etchells is interested in the cross-contamination of both sensibility and syntax when virtual world leaks into reality. Compelling. The Broken World is absorbing and accessible, merging the cyber and everyday lives of an unnamed narrator who is obsessed with writing the walk through (or detailed strategy guide) for a shoot-em-up computer game. One of the first books that truly examines how computer games and fiction can be intertwined. More than any book I've read, this feels a convincing portrayal of the life of a contemporary adolescent. Etchells manages to discover a strange poetry in this humdrum man's life. 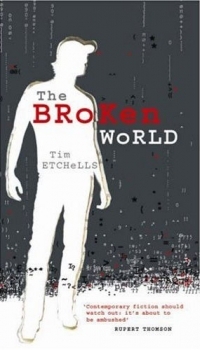 By the end of the novel we care about "The Broken World" almost as much as the narrator does. The Broken World is a genuinely new development in literary fiction. The narrative voice is funny, likeable and impressively consistent, though Etchells has come up with an ingenious way of shoehorning in a few literary effects when he wants them: the narrator lifts uncharacteristic passages of lyrical description from other websites dedicated to The Broken World, and there are allusions in the game to The Waste Land, The Trial and Bleak House.